Not many people outside its immediate neighbouring communities know of its existence. The community lags behind its peers inform of development. Though clothed in neglect and underdevelopment, it has enviable history; one so rich and glorious. The story of the old South-west region and its lofty achievements and feats including the first television station in Africa, Mapo Hall, free education – cannot be properly told without a generous mention of the rustic community. Welcome to Eti-Oni, the pioneer and major cocoa-producing community in Osun. Recently, the town headed by the Olooni of Eti-Oni, Oba Dokun Thompson, celebrated an unusual festival: Cocoa Festival. Oba Thompson said the festival was organized to mark 12 decades of continued cocoa production in the community. Oba Thompson said the cocoa festival became necessary to remind people of the huge benefits of cocoa in the South-West in the past and to encourage the cocoa farmers not to relent but to inspire their children to pick interest in cocoa farming. The monarch who said Eti-Oni had the oldest cocoa plantation in Nigeria, however, lamented that despite the community’s huge contributions to cocoa wealth in the South-West region, it has remained underdeveloped, compared to other towns in Osun and other South-West states. He said the abject poverty would persist, until the land was appeased to break the curse responsible for the age-long backwardness. The monarch traced the origin of the curse, lamented to the gruesome manner Oba Emmanuel Olajide Layode, the Soun of Ogbomoso, in 1969 during the Agbekoya revolt following the hike in taxation on cocoa. The monarch lamented that the wealth from Cocoa did not reflect in the community and the people because of the curse. The monarch prayed for appeasement of the land so that the late Oba Layode’s soul might finally rest in peace and for a renaissance of the wealth created in the western region from cocoa in the 60s. At the festival tagged Gureje Day, Oba Thompson lifted a holy Bible presented to him by the Christian community in Eti-Oni. He prayed and pronounced blessings on the community and the nation. The traditional ruler also disclosed that the Eti-Oni premium chocolate would be unveiled soon and sold online in Europe before it would be brought to Nigerian market. According to him, the chocolate would be developed to boost Nigeria’s export profile. The Osile Oke-Ona Egba, Oba Adedapo Tejuoso who was the royal guest of honour, joined Oba Thompson in appeasing the land, as he also pronounced blessings upon the land through the scriptures. Governor Rauf Aregbesola reiterated the need to go back to farming, insisting that crude oil was no longer sustainable as the mainstay of the economy. He commended Oba Thompson for his pragmatic approach in redirecting the attention of the people to ensure profitable cocoa production that would bring maximum gains to the farmers and improve the fortunes of the people. Aregbesola who was represented by the Coordinating Director in the Osun State Ministry of Agriculture, Food Processing and Youth Engagement, Dr. Isaac Aluko, promised full support for any initiative geared towards agribusiness. The governor formally presented the Premium Artisan Eti-Oni Chocolate Brand to the public and also launched the Eti-Oni Model Smart Town, which is to be developed in line with the United Nations 2030 Sustainable Development Goals. The governor urged other traditional rulers in the state to take a cue from Oloni of Eti-Oni by coming up with initiatives that would promote the agriculture potentials in their domains. Eti-Eni is not satisfied with just wallowing in its ancient glory as pioneer cocoa farmers. Rather, it is determined to be a big player in the Federal Government’s efforts to ensure a paradigm shift from a mono economy built on crude oil, hence it has formed an alliance with the Osun State Government to fashion out initiatives to boost cocoa production. The thrust of the vision is to drive productivity and broaden wealth creation opportunities through cocoa farming for inclusive growth and development not only in the state but also in the entire country. Dr. Charles Akinola, Director General of Economic Development, Governor’s Office and Coordinator, Osun Rural Enterprise on Agric programmes and Oba Thompson told Daily Sun that the collaboration would bring a revolution to cocoa farming and production to drive economic prosperity as a part of effort to navigate the economic recession. 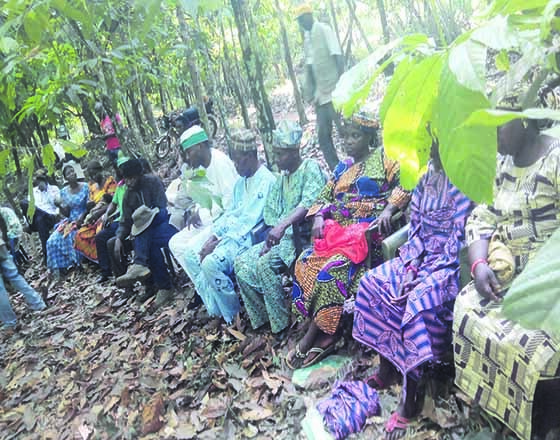 Recently, the state Ministry of Agriculture, Food Security and Youth Engagement as well as Osun Rural Enterprise and Agricultural Programme organised a farmers field school as well as farmers business school to orientate cocoa farmers in the community on the best ways to go about cocoa farming to drive productivity and maximum profits. The schools would focus on discussions between experts on the needs, problems and challenges facing farmers in order for government to proffer solutions. “We have come to support what Oba Thompson is doing in this region, Eti-Oni, which is reminding us of the early beginnings of the cocoa industry in Western Nigeria. This is one of the richest areas of cocoa production in Nigeria. We are going about the rebirth of cocoa industry. We want to ensure that the cocoa farmers are not solution takers, but those that would be encouraged to participate in developing solution in cocoa farming,” Dr. Akinola said. He said the initiative would help to identify the needs and problems of cocoa farmers and draw a blueprint on ways government can assist the farmers. “The farmers are the ones that know their needs and challenges. This determines the kind of intervention that government will work on to find solutions. The problems identified by the farmers determine the kind of training they would be given to find solutions to their challenges,” he said. To demonstrate it readiness to back the back to land drive, especially cocoa production in the community, Governor Rauf Aregbesola has begun road rehabilitation project to enable the farmers transport cocoa and other farm produce to the markets. Discussions were held right in a cocoa farm in the community between the farmers and experts from the farmers field and business schools to orientate the farmers and to find out their needs. As a part of programmes lined up to develop cocoa farming in the community, a cocoa festival was organised to train farmers on modern technology in cocoa farming to enable them produce high quality cocoa and make maximum profits through proper cultivation, harvest and marketing. It provided a platform for stakeholders to share ideas on cocoa production and other aspects of agribusiness as a way out of the current recession.